2018 Summer Camps Are Nearly Here! FINAL DATE FOR REGISTRATION IS TOMORROW 23rd JUNE. You can register tonight Thursday from 7-9pm or Saturday from 10am til 12 noon. 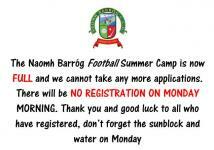 Last day for children to hone their gaelic games skills before the Summer Camps! 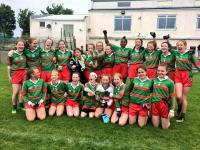 Congratulations to our U14 Girls who won the Div 6 Football Féile Final today by beating Scoil Uí Chonaill in a tight, action-packed final. Naomh Barróg Girls Reach Féile Div 6 Final!!! Time to break out from the cabin and shake that fever! 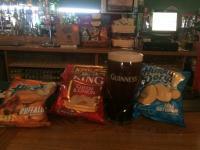 The bar in Áras Bharróg will reopen at 6pm tonight. The pool table will also be rolled out. The main gate is closed so please use the pedestrian entrance.The bar opens at 5:30pm tomorrow.